Beekeepers are neither equipped nor insured to remove bees from roofs, chimneys or other cavities in buildings. If you have bees in such a location you will need the help of a specialist company such as BeeGone who try to ensure the bees are humanely removed and re-hived. Look at the photos below and decide what sort of 'bees' you have. Beekeepers will only remove honey bees. ​If they are somewhat round and clearly furry, they are bumblebees. The bumblebee conservation trust provide information on nests. ​If they are not furry and have very distinctive black and yellow banded stripes, they are most likely to be wasps. Call your local council or pest-controller for help. ​If they are neither of these, but about the same size as a wasp, but do not have very distinctive stripes, they are probably honey bees. A swarm of honey bees is very distinctive - you are likely to see thousands of bees swirling quite dramatically across the sky and finally settling around a cluster of bees on a branch or man-made object some way off the ground. After an hour or less, the flying activity will more-or-less cease and the hanging cluster of bees will remain in place. Often this cluster will look like a rugby ball. This is a swarm and eventually, if left to itself, this cluster will fly off to a new home, usually within 24 hours. However, such a new colony is unlikely to survive in the wild so needs a beekeeper's help. 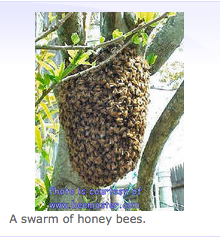 If you do have a swarm of honey bees, and they are easily accessible, then call your nearest beekeeper on the list of swarm collectors below. Who is my nearest swarm collector?